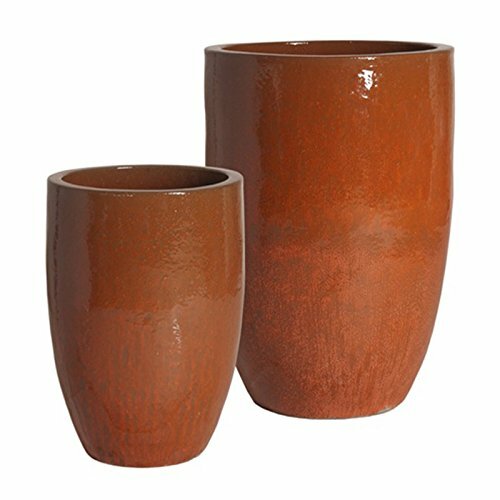 Tall Round Ceramic Planter - Paprika Red (set of 2) | Fountain City Art Ctr. Our gorgeous collection of indoor/outdoor planters are made of high-quality ceramic with authentic detailing. Note the exquisite pattern in relief, the shape and the texture with some being ornate and some subtle to accommodate your own room scenario. An elegant accent inside or outside, our chic planters will add a dramatic twist to any decor. Showcase them indoors in your living room, bedroom, bathroom and outdoor on your patio, pool area or garden.